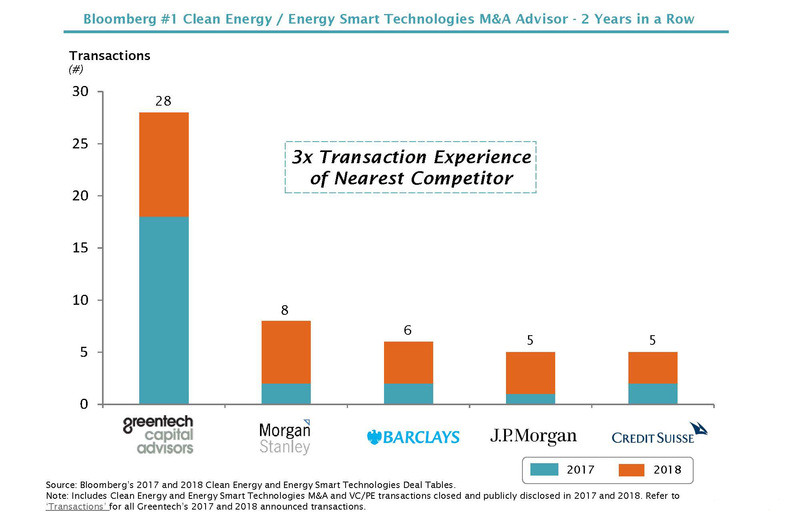 Greentech Capital Advisors (“Greentech”) has been ranked #1 in 2018 and 2017 by Bloomberg for number of transactions for Clean Energy and Energy Smart Technologies M&A. Our mission is to empower companies and investors who are creating a more efficient and sustainable global infrastructure. We are purpose-built to ensure that our clients achieve success. We have deeply experienced senior bankers who are sector experts and understand our clients' industry and needs. We reach a vast global network of buyers, growth companies, asset owners and investors, and thereby provide clients with more ways to succeed through a deeper relationship network. We have directly relevant transaction experience which enables us to find creative structures and solutions to close transactions. We are an expert team of 65 professionals working seamlessly on our clients' behalf in New York, Zurich and San Francisco and through a strategic partnership in Japan. Our team of experienced bankers provides conflict-free advice and thoughtful, innovative solutions.